Across Minnesota, hundreds of wooden bridges are reaching the end of their lifespan, but counties don’t know which ones to repair and which ones to replace. In 2010, a timber bridge partially collapsed in Nobles County, heightening concerns about the state of inspections statewide. “A lot of it right now is just visual and sounding the wood – striking it with a hammer and interpreting dull or hollow sounds,” said MnDOT State Aid Bridge Engineer David Conkel. Timber bridges are at a critical point in Minnesota, not only because of the sheer number built in the 1950s and 1960s, but because it’s difficult to judge their structural soundness without advanced equipment. While current inspection methods adequately identify areas of advanced decay, they do a poor job of detecting early decay or internal deterioration, especially in the timber substructure. The most troublesome area of decay on a timber bridge are in the pilings, which usually have contact with the water. The drying and wetting of the water causes rot to form. Identifying internal deterioration early is essential because once significant rot is noted, a timber bridge can slip into a severe condition within just two to three years. Early bridge makers treated timber bridge elements with creosote to prevent decay from fungi and insect damage. However, because it was typically applied to the shell, a good external condition may hide severe internal deterioration. 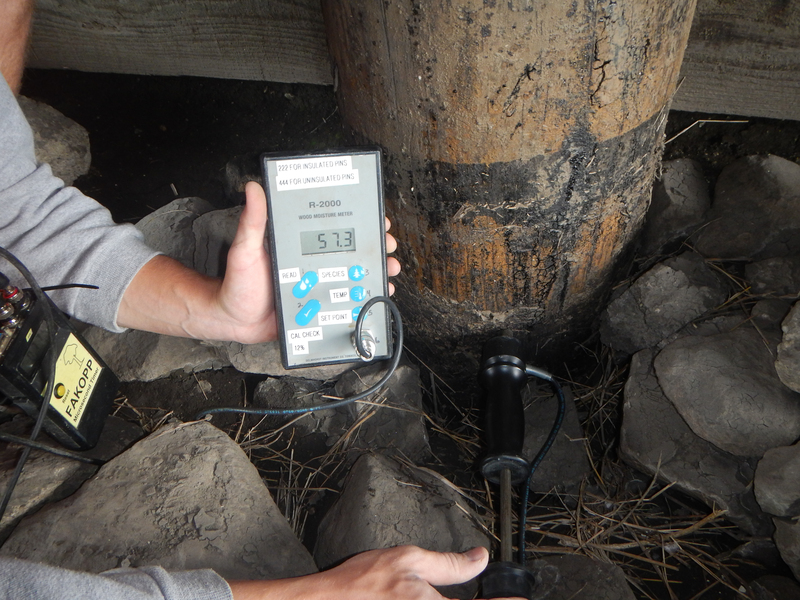 Resistance microdrills and stress wave timers are two proven inspection tools that counties can use to see past the surface of a timber bridge and identify the actual amount and area of internal rot. But Minnesota counties have lacked this equipment and the training. “These tools will enable us to identify the bad bridges before the decay shows up visually– but it will also tell us which bridges are still good so we can allocate the funds we have to replace the worst bridges,” Hemmila said. A stress wave timer (video above) locates bad areas on a bridge by using probes to measure the time it takes for sound to travel through the material. A decayed piling will have a time that is more than double that of a sound piling. A resistance microdrill (video below) can then be used to determine how much good wood is left in a piling or timber element by drilling a bit into the wood and measuring the resistance. MnDOT and the LRRB are developing a customized inspection manual and standardized inspection protocols, which can be integrated into the state’s bridge data management software. 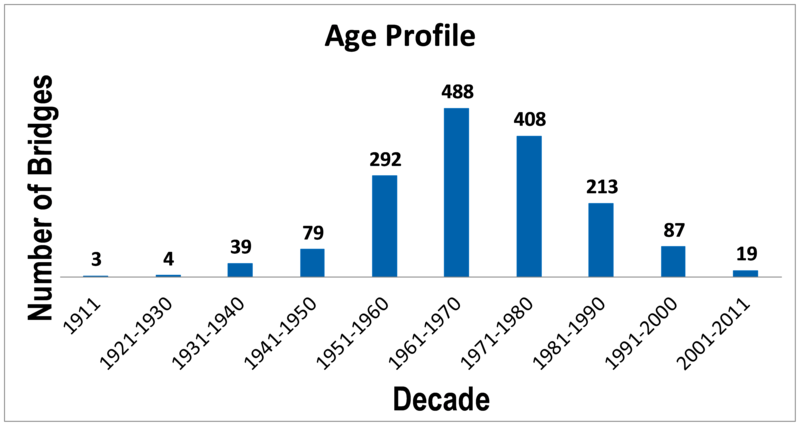 Minnesota has one of the highest concentrations of timber bridges in the country — 1,600 (down from 1,970 in 2001), more than half built before 1971. These bridges typically start experiencing issues in their substructure when they reach 40 to 60 years old, with decay usually occurring where the piling meets the ground or water line – a perfect environment of air and moisture for rot to thrive and propagate. Unfortunately, some bridges were unwisely built on the pilings of former bridges. “Well-maintained, well-designed and well-treated bridges can last a long time, equivalent to other materials,” said Brian Brashaw, director of Wood Materials and Manufacturing Program at the University of Minnesota-Duluth. Because bridge engineers have been unable to fully assess the internal cross-sections of timber bridges, they have been very conservative when assessing timber bridges, Brashaw said, resulting in load limit reductions and bridge replacements. “The use of advanced techniques will take the guess work out of the equation, allowing for better decision-making on which bridges need repair or replacement now,” Brashaw said. With no formal national or state guidance, MnDOT and the Local Road Research Board undertook a research project to identify state-of-the-art inspection practices and marry those techniques with the needs of Minnesota county engineers. “We don’t have enough money to just replace all the timber bridges, so we want to provide county engineers with more advanced inspection tools so they can determine how much decay there is in the piling, and other susceptible areas,” Conkel said. A second LRRB project, led by Iowa State University, is advancing the development of cost-effective repair techniques that counties can use to lengthen a bridge’s service life. “We can’t build them fast enough, so we have to find a way to make them last longer so we can catch up,” Hemmila said. *All classes 9:00 a.m. to 3:30 p.m.